This year’s summer blockbuster season, which kicked off with The Avengers, is underway with many big films in the pipeline. Movies have always provided brands an opportunity to ride the wave of popular culture, and with social media, they can reach already engaged audiences. Campaign data like this can help inform marketers on successful social strategies for aligning their brand with movies and beyond.-Source Adweek May 2015 – Discussion on Avengers Age of Ultron. 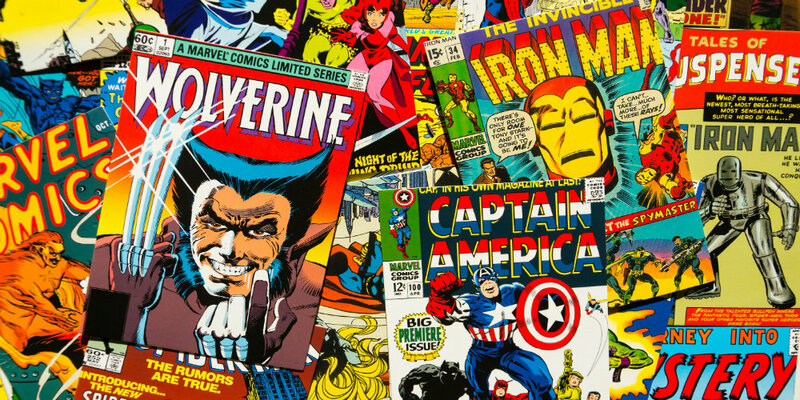 As a Marvel Cinematic Universe fan…in layman terms….a Marvel Movie Fan, I believe that the creative minds have successfully transitioned the comic book heroes to theatre stars differentiated by personalities and powers. 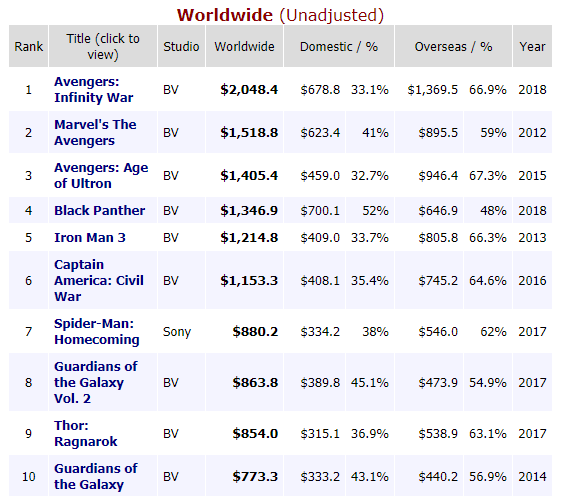 This has not only skyrocketed company revenue but it has opened the movies to the otherwise non comics fans. There are several lessons to be learned; however, in this article, I’ll focus on the Engagement Opportunity with minor focus on lessons. What are the benefits of engagement? Market ripe and ready for harvest..almost a free lunch! Why is the engagement opportunity huge? The Avengers as a team is no longer just some comic book heroes in spandex; they are now distinct personalities that connect with different emotions. These when combined continues to enthral audiences globally because there is also a question as to what’s next. A look at Box Office Revenue will show that the previous three (3) Avengers movies hold the top 3 positions in the Marvel Cinematic Universe in addition to Top 10 Grossing Movies of all time positions. This means that ALOT OF FOLKS go to the theatres to watch these movies. After all it’s all your favourite heroes in one movie, who wouldn’t want to see that? But WHY IS THE AVENGERS ENDGAME HUGE? 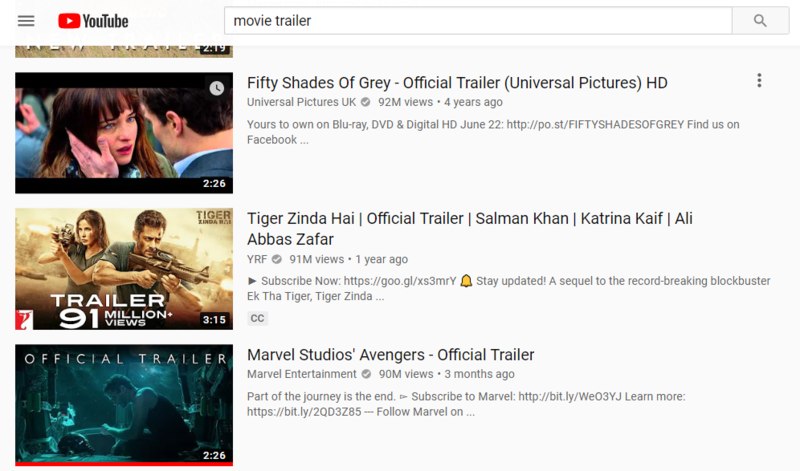 As of March 13th, the trailer currently has the 7th highest movie trailer views on Youtube at 90M+ [see picture below]. Supporting this is the number of movie prediction theory videos as to what will happen. Marvel has done a fantastic job on being tight lipped to drive expectations/suspense. 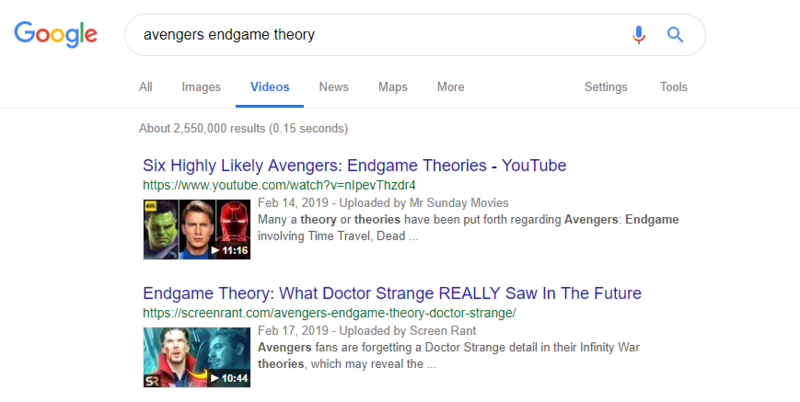 There are approximately 2.5M Avengers Endgame Theory videos according to a Google Video Search [see picture at end]. What’s the driver behind this? Again one may ask, what’s the real driver? Fans have grown accustom to their super heroes winning. After all that’s the reason they are called super heroes, they always win. At the end of Avengers Infinity War, the villain won. Strange, unexpected, non-linear…….but true. This is further compounded by the fact that some of the heroes have disappeared and some instrumental gadgets which is of use to the heroes have also been destroyed. To even further compound this, none of the remaining superheroes known to be alive in the movie, seem to have an answer. Oh what a world they have found themselves in…! Think about it: As a movie goer, you would have watched the previous Avengers movie with many questions as it ended. This not only guarantees that you will definitely purchase a ticket to see it on the big screen in search of the answer but you will be engaged time draws near. This shock will have also led folks who may have not otherwise looked at the movie, to view it through another form of media in preparation to see the Endgame on the big screen. Marvel will definitely win, but how can your credit union benefit?…YOU NEED TO ENGAGE THE AUDIENCE! M1: PREDICTIONS – Get your members/target members to predict what’s going to happen in the movie through the use of video content. The winners could be rewarded with VIP Movie Parties, Movie Items etc. In the age of video consumption content, you’ll be blown away by how engaging this method will be. M2: DIRECT COMMERCIALS: These are quite expensive in the modern era especially in context of credit union membership bonds. I do think that a commercial directly aligned to the credit union message will be fantastic. Think of relating a Credit Union as an EndGame meaning that to win in life/survive the endgame, members must use a credit union. Food for thought – it’s a massive opportunity for collaboration. M3: GAME CREATION: Gaming is synonymous to super heroes and the target market of Millennials and Gen Z. If while using their mobiles, you can have a one or two level Avengers related game through your application, this will be a massive win. Games are always an easy way to grab attention. If you don’t have a mobile application for your CU, traditional simple games can be used. If you want to add further engagement on a deeper level, you can open the game creation ideas to your members. M4: ROLE PLAY/COSPLAY: It’s a superhero movie after all. Who wouldn’t want to dress like their favourite hero with a chance of winning something? Put it to your members and you’ll be surprised! 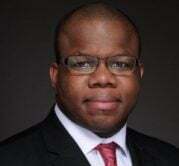 In addition to these customized and directly related ideas, you also have the option of the traditional whereby you focus on a Credit Union product/offer/principle and those who engage are rewarded with EndGame related items. If you have any other ideas for engagement, please share. Marvel has taught organizations several lessons from starting with the end in mind, creating product personalities etc. An example of this will be Dr Strange. In the MCU of the 21 created movies thus far, Dr Strange was 12th grossing approximately USD677M. Given his role in the previous movie, I can easily see this figure being surpassed. Fans who may not have gone to the movies to see the first movie, now saw him in a different realm which drives 2nd movie viewership. In the context of your Credit Union, think of it from the angle of really positioning yourself in the eyes of the member. The first time they use you, if you go beyond the call and really create a matched personality to the member’s needs, the next time you are not only guaranteed business but references which compounds income. Also in terms of attracting the Gen Y/Z, it may be a case of exploring a different side of you to create the positioning you require. L1: Villains make good business: Avengers wasn’t only about our broken superhero team but the wrath of a villain in search of self-peace. A villain who isn’t just about evil but self good driven by an emotional gap. How can this be adapted to Credit Unions? You may see fintech as competitors or villains attacking your core services but partnering with them will create opportunities for good business. Have a think! L2: Playing on RELATED channels: Credit Unions and pop culture often aren’t heard in the same sentence by Millennials and Gen Z. If you show up on these channels, you begin the engagement cycle. L3: Evolution: Avengers Endgame is the last movie in Phase Three of the Marvel Cinematic Universe. Yes, we love our superheroes; however, market share is about evolving around the consistent. Humans love superheroes is the consistent, the characters may change. As markets grow and evolve, so must the superheroes. In terms of your CU, what are your areas for evolution; it may be products, mindset, Board Dynamics, Organizational culture. Have a think and discussion with your team! 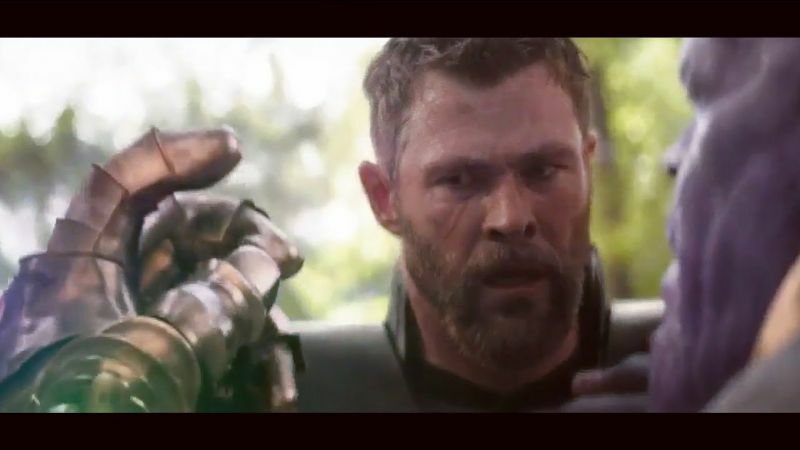 L4: The Art of the Interlock: Marvel has had a super cool way of dropping characters in other films to allow for that big picture which creates expectation and deepened connections. In the context of your Credit Union, you may have had several ultra-successful engagement methods, marketing campaigns etc. – keep repurposing and repackaging them to drive your message across. L5: The Extra Shift: I remember at the end of a movie long time, everyone would rush to the doors. At the end of Marvel movies, if you leave before Post Credits…you’ll be that person to miss out. Marvel always gives that extra which creates buy in. In the context of the credit union, what’s the extra you are giving to drive member engagement? They use your product, then what?